I am such a history buff. I love learning about history and some of my fondest memories were of summer vacations spent hanging out with my dad, traveling from Civil War Battlefield to Civil War Battlefield. I was obsessed with Abraham Lincoln at the age of nine and I even (begrudgingly at the time because I had to wear a really stupid costume that I hated) participated in a historical recreation of certain town when we lived in Illinois. History, I think, is awesome. So, when Lily's teacher announced they would be going to this thing called Trail Days at Pinhook Park, I was totally all over it. It didn't matter that it was only 40 degrees outside, I wanted to go with Lily and her class and learn all about the history of South Bend, which I admit, I don't know much about. So, Wednesday morning, I wake up bright and early and pile on the clothes, pack lunches for both Lily and myself, hunt down my sketchers (which were the closest thing to hiking boots I have) and make sure I have an empty camera. The teacher said "you will get muddy." And then, it starts drizzling. Tuesday we had all but a tornado (which actually there were reports of one a few miles away), so mud was expected. I get Lily up and dressed, we eat a decent breakfast and we're out the door. When I walk into the school, the secretary announces that they were delaying the start of the field trip for an hour. No problem, I head to Star Bucks for a chai fix. I return an hour later, belly warm, and head down to Lily's classroom where I partake in a rousing (and often cheated on) game of Measuring Monkeys. The field trip is delayed another hour. 9:30 rolls around and everyone starts getting ready to go. Kids are sent to the bathroom (and I follow suit), the ones who have coats get their coats on, and then we all head out the door and onto the trail that will lead us to the St. Joseph River. I was definitely channeling my inner Jack for this field trip. 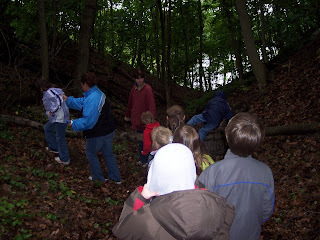 We climbed down a long steep bank, listening to our "guide" talk about early life in South Bend. We came to the river and there were some more "settlers" that talked of the native americans and fur trappers and as they talked they shared "pioneer popcorn" with us. And then came the boats. We crossed the St. Joe River in boats. Imagine sharing a boat with about 6 first graders, half of which were boys, completely bent on tipping us over, while the girls screamed "NO NO NO!!!" I laughed at the whole thing, Lily laughed, and somehow I was the only one that managed to get their pants wet. I still have no idea how I did that one. Several boat trips later, the entire class was across and in the last boat came the teacher, with practically the entire class chanting "TIP THE BOAT! TIP THE BOAT!" as she crossed. I don't think she knew what they were chanting because she was laughing and rasing her arms into the air in what I can only guess was mock agreement? Once across the river, we met up with "Princess Mishawaka" who told us about how the city was named for her and a brief history of Mishawaka and we also met a local fur trader named "Pierre Navarre" who told us about various animals that he trapped. We then, visited about a dozen or so stations each with different "settlers" that showed us various things about how people used to live during the time period (early to mid 1800s) and various tidbits about history. The only bad thing about the day was that it was absolutely FREEZING outside. The wind was unforgiving and I ended up unzipping my coat and sheltering both Lily and her friend Kate in my jacket to keep them warm. Poor Kate was so cold that her teeth were chattering! Thankfully, with the three of us huddled together, we were able to stay pretty warm and the "settlers" eventually had a nice warm fire going at every station for us to huddle by while they told us stories and taught us songs from the pioneer days. 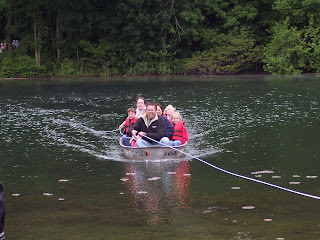 Lily's favorite moment, though, had to be when they got to do a bit of fishing. Somehow, she has gotten it in her head (prior to yesterday) that she wanted to go fishing. Never mind that neither I nor her dad have ever gone fishing (let alone expressed an interest in it), she has wanted to go fishing for a while now. So, when she found out they had fishing poles set up for the kids to try (tree branch with string and a hook, pick your own worm thank you very much), she was thrilled. She selected her pole, got a worm (with the help of friend Garrett who was not shy about selecting a worm at all), and headed for the waterfront. 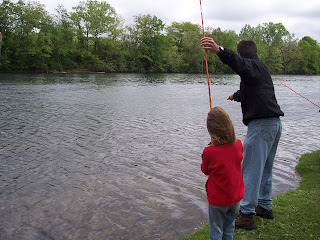 With the help of one of the dad's that was along on the field trip, she cast her worm into the water and we waited. About five minutes later, there was a tug!! The pioneers had attached very modern bobbers to the string just in case, so when it dipped below the water, I jumped and told Lily to pull in her string. We ended up not catching the fish, but the fish most certainly took the bait! Lily was the only one that came that close to catching a fish! It was really quite awesome! With the fishing, came the end of the field trip and we all loaded up into minivans to head back to the school. Everyone was cold and tired and the chaperones decided it would be better for everyone to have lunch back at school where they could warm up, so off we went. After making sure Lily was back in her classroom, I headed home to have my own lunch. By this point I was quite tired, but had to stay up because Lily would be dismissed in about an hour and a half. Luckily, with the delay of the field trip, I managed to help Lily get all of her homework done in the morning so she wouldn't have to worry about anything when she got home. At 3:00, I picked Lily up and we came home, both changing into p.j. 's and settling on the couch to discuss the days events. I lasted about an hour after that and headed up for a nap. I may have been able to make it through not only a very muddy trail (in my opinion the best part next to the whole crossing the river bit), but walking all over a very large park until 1:00 in the afternoon. All while 23 weeks pregnant (which is the start of month 6). I felt really good. Tired, but really good. I "napped" until about 9:ooPM, when I woke up, went to the bathroom, ate some food and then headed back upstairs and crashed again around 10:PM. Today I feel pretty good but very tired. I'm a little achy, too. Although, Jack seems to want to go back out and play. I was thinking about taking Casey to the trail this weekend if we have time. It was a really cool trail. I know the people won't be there, but it would still be really cool to explore and show off. Casey, it seems, has other plans this weekend. Something about organizing his new truck. Oh well, maybe next weekend? So yeah, that was my grand adventure for the month. I can't wait to do it again!